In addition to the site itself, Jackie puts on a monthly reading on the last Monday of the month. This month, I’m one of the readers. I asked Jackie to join me for 5 Question Friday but then my week got very busy and I didn’t get a chance to give her the questions until Thursday night. Jackie stepped up and got back to me right away. So I’d like to give her a special thank you for that. 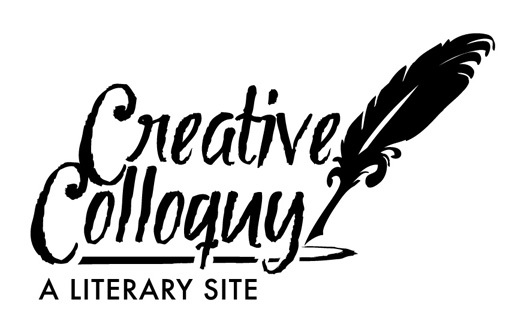 The short version: Creative Colloquy is a “submission based literary site” with a focus on Tacoma and South Sound scribes paying special attention to writers of short stories, essays, and excerpts of novels. But really “colloquy” by definition means to pow-wow, or open up a dialogue so our events play an instrumental part of that. It was born from the desire to create a platform for writers to share their work and build relationships with those of like minds. Writing is typically something done as an isolated individual but connecting with those who understand the struggles or process I think can be really inspiring and necessary to the creative process. Plus it’s just plain fun. 2. How can someone get involved in Creative Colloquy? The easiest way to get involved is to submit! We publish our favorite submissions every other Monday and have so far featured immensely talented and diverse content. Another great way is to attend our events. Each final Monday every month we meet at B Sharp coffee house at 7pm. Festivities begin with a line-up of 5/6 authors we’ve published on the site reading from their works immediately followed by an open mic. The dynamics of the event pretty much guarantee performances from a variety of genres and experience levels. Other events are in talks to occur over the summer and some really cool things happening by fall that we aren’t quite ready to announce. 3. What’s been the most interesting thing to come out of this project so far? Any time artists gather in one place it’s interesting. The stories that are told among a group of scribes especially so. I think the most interesting thing is seeing the diverse community coming together at the events. We’ve been joined by young college level novices attending their first open mic to established published authors, playwrights, actors and so on covering so many different genres. Witnessing those interactions can be interesting. The level of support has been ridiculously amazing and leaves me feeling pretty fortunate to have begun this adventure. 4. What’s something you want to do with Creative Colloquy that hasn’t happened yet? We have been in discussion of adding some texture to the site. A podcast is something we are uber excited to do and we have some fun ideas to open a dialogue and entertain our audience. I’d really love to begin doing dramatic readings with actors performing larger pieces and getting crafty with a set design that mimics a huge pop-up book too! There have been some other seeds planted that include a panel discussion at UPS and highlighting local women storytellers with a Tacoma group working towards a living women’s museum and maybe even some children themed events for the minis out there. 5. What would you like to see for the future of Creative Colloquy? I’d love for CC to gain non-profit status in efforts to promote literacy. I daydream about dramatic reading events for schools and festivals and a bookmobile cruising around town. We’d really love to release a “best of” print version maybe twice yearly for distribution too. That’s more of a when not if and HOW we are going to fund the project when it’s time. For now we are just having a great time reading local talents stories and connecting at the events. It’s been really amazing having folks turn out that aren’t necessarily in our “circle” and building those relationships based on our literary love. Once again I’d like to thank Jackie for participating in 5 Question Friday. For more information about Creative Colloquy or just to check out some local writers, go to http://creativecolloquy.com.